The Music Concourse is an open-air plaza within San Francisco's Golden Gate Park originally excavated for the California Midwinter International Exposition of 1894. After the fair, it underwent a significant redesign in order to be repurposed as a venue for public gatherings centered around music performances. The focal point of the plaza, Spreckels Temple of Music, also called the "Bandshell", was built in 1899 in advance of the Music Concourse's completion in 1900. It was severely damaged in the 1906 and 1989 earthquakes, has repeatedly undergone extensive renovation, and has served as a stage for numerous performers over the years including Luciano Pavarotti and the Grateful Dead. It has for decades been the venue for annual celebrations of the anniversary of the Polish. Three fountains line the center of the plaza with a fourth at the top of a staircase adjacent to the bowl. The plaza is planted with many trees laid out in a regular grid array. The trees, mostly London plane and Scotch elm, are heavily pollarded to give a very regular and formal appearance to the plaza. 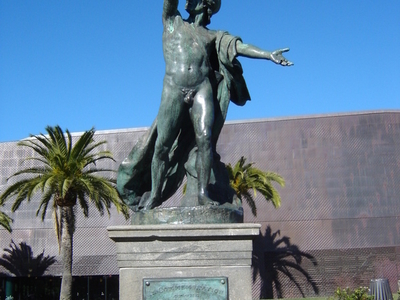 Numerous statuary dot the area, including representations of a Roman gladiator, Ulysses S. Grant, Ludwig von Beethoven, Giuseppe Verdi, and Junípero Serra. At the opposite end of the Music Concourse from the Bandshell is a monument dedicated to Francis Scott Key, though this was not its original location, having been moved to this spot in 1967. Several pedestrian tunnels lead from surrounding areas directly into the bowl. In the 2000s an extensive renovation of the Music Concourse and construction of new buildings for the two museums was performed, together with the installation of an underground parking garage. Here's the our members favorite photos of "Plazas and Squares in San Francisco". Upload your photo of Music Concourse! Slim Choyo is the only Touristlink member to visit Music Concourse. Have you been here? Click here to save it.